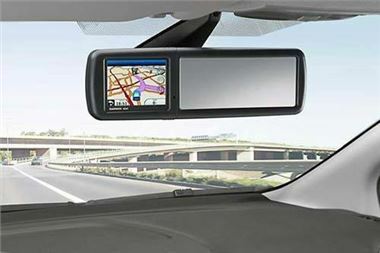 Ford dealers now offer a sat nav unit fitted alongside the rear view mirror in an extended holder. Replacing the original rear view mirror, "MirrorNavi" means drivers can see the navigation at the same time as checking the rear view. It is compatible with Ford car and commercial vehicle ranges and can be fitted in an hour by a Ford dealer and is mounted without any visible wires or damage to the main instrument panel. Insurance companies have confirmed that "MirrorNavi" is defined as a fitted navigation system for their purposes and another advantage is the absence of suction cup marks on the windscreen which might alert thieves. The "MirrorNavi" itself has tinted and dimming mirror glass, battery charging connection and anti-theft security and it is available on all Ford cars and vans. "MirrorNavi" is made by Garmin and Wollnikom and includes a 3.5-inch touchscreen colour display, an internal memory and card slot, 2D or 3D map display, destination memory, EcoRoute and maps and voice response for more than 70 countries and languages. Available now, "MirrorNavi" costs £299 plus local dealer fitting charges.